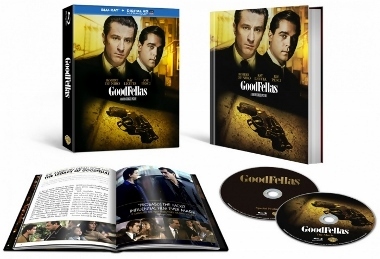 On May 5, 2015, Warner Bros. Home Entertainment will release the very best home video edition of Martin Scorsese’s classic 1990 Mafia epic GoodFellas to date. Scorsese personally supervised the brand-new 4K scan (made from the original camera negative). Fans have long bemoaned the subpar elements used in previous reissues, dating all the way back to laserdisc. Truth be told, that now-archaic format actually looked great for its time, but subsequent DVD and Blu-ray versions improved only incrementally. Now, Michael Ballhaus’ award-winning cinematography does indeed look richly cinematic in the new transfer. No more smeary, over-saturated reds, no more total loss of fine detail in dark shots, no more black emulsion scratch over Robert De Niro (during the “you can’t divorce Karen” scene) – it’s pretty much all good now. Scorsese’s masterpiece (well, one of them at least) has been given the respect it deserves. Plus, we finally get a lossless soundtrack. The DTS-HD MA 5.1 mix does a superb job of balancing the multitude of competing audio elements. GoodFellas is a mix of shouting, muttered asides, group dialogue scenes in noisy environments, near-constant pop and rock songs, and a steady stream of narration. In other words, it’s an intentionally, artfully messy sound design overall, one brimming with excitement and dynamic shifts. No sonic detail is unimportant. It’s great to hear it all so well-balanced with every detail in its proper place. So that’s the big news for anyone trying to decide whether to upgrade from the previous Blu-ray release (or for anyone who avoided GoodFellas altogether, holding out for a properly remastered presentation). The wait is over and the new edition is a keeper. All the special features found on the previous digibook edition are included (two commentaries on disc one, all the video-based material on disc two). The one all-new feature is a half-hour featurette that includes most of the principals (with Joe Pesci conspicuously absent) reminiscing about the film’s production and marveling at its impact a quarter-century later. If I was going to air any minor grievances about the 25th Anniversary Edition, it’s that there is still some black crush in dimly-lit wide shots. I’m guessing though, given the circumstances, that this is just something inherent in the original cinematography. Every so often, there were just a few minor inconsistencies, with certain shots appearing a bit soft when compared with the generally-enhanced clarity in the new transfer. The now-slightly muted color palette took a bit of getting used to, though with Scorsese supervising I’m guess this is how he wanted it (assuming all his directives were adhered to). With the man himself signing off on this version, it’s difficult to take issue with anything. I think it’s probably safe to say this is the ultimate GoodFellas home video presentation we’re likely to see. A quick recap for the sake of anyone new to GoodFellas… Based on the true crime book Wiseguy by Nicholas Pileggi (who co-wrote the Oscar-nominated screenplay with Scorsese), the movie tells the life story of real-life Mafia associate Henry Hill (Ray Liotta). We meet Henry as a kid and quickly become swept up in the glamorous, lavish lifestyle he is allowed to lead. But we also meet dozens of “wise guys,” Mafia soldiers who’ll kill at the drop of a hat. Liotta strikes the perfect balance of portraying Henry as a person who we, the audience, can relate to (to some degree, at least). He remains an outsider thoughout, no matter how many Mafia secrets he is privy to under the leadership of Paulie Cicero (Paul Sorvino). He’s often aghast at the vicious violence he witnesses, but never so much so that he tries to extricate himself from the life (not that he’d be allowed to even if he wanted to). The only truly weird element of the entire package (which also includes a Blu-ray case-sized hardcover picture book, housed together with the case in a slipcover) is the new cover art. Of the many things that make GoodFellas an all-time classic, it’s impossible to overlook the importance of Joe Pesci’s Oscar-winning supporting turn as sociopathic mobster Tommy DeVito. I understand Warner wanting to distinguish this new edition – since it is truly new, in terms of remastered visuals and lossless audio – from the many previous reissues. 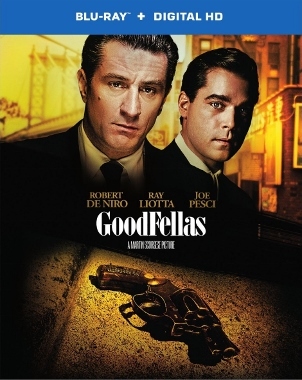 Ditching the iconic shot of Robert De Niro flanked on either side by Ray Liotta and Joe Pesci (all dramatically lit against a black background) is… okay, I guess. But an edition like this should warrant a Criterion-level redesign of the cover. Not a slapped together, incomplete, temp-looking image of De Niro with Liotta in the background… and no Pesci. This was an opportunity to put the film’s true lead – Ray Liotta – in a central position, and perhaps add Lorraine Bracco (Oscar-nominated for her role as Henry’s wife, Karen). But the cover art isn’t all that important in the grand scheme of things. Warner Bros.’ GoodFellas 25th Anniversary Edition Blu-ray also includes a downloadable Digital Copy.